Head down to London's South Bank any given day and, amid the crowds of tourists and shoppers, you'll find a vibrant street music scene. Close to attractions like the London Eye and the Royal Festival Hall, guitar-slinging buskers seek attention with the hits of the day — songs by Sia, Taylor Swift and Coldplay, to name a few. But one exception to the rule, Stickist and regular on the South Bank scene, Pascal Glanville draws them in with a unique instrument and pianistic arrangements of more "classic" repertoire, — Neil Young, Nirvana, Bob Marley, Tori Amos, Radiohead, Jimi Hendrix and popular classical and jazz pieces. Amid these familiar tunes interweaving his own compositions and Keith Jarrett-style improvisations. 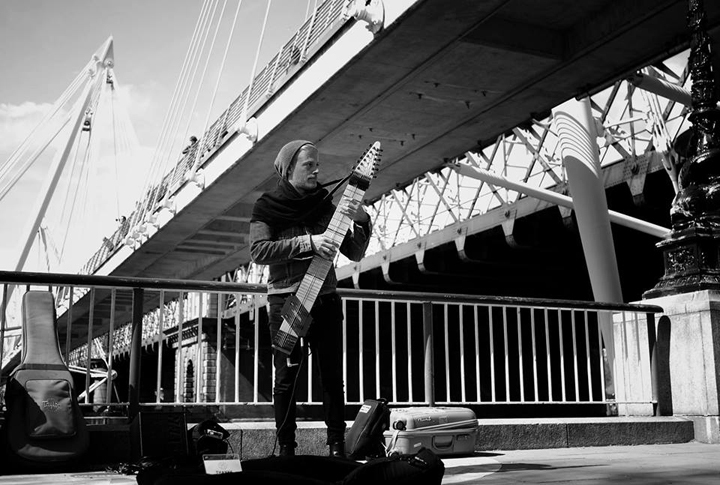 Pascal Glanville, busking in all kinds of weather, below the Hungerford Footbridge on London's South Bank. map it! 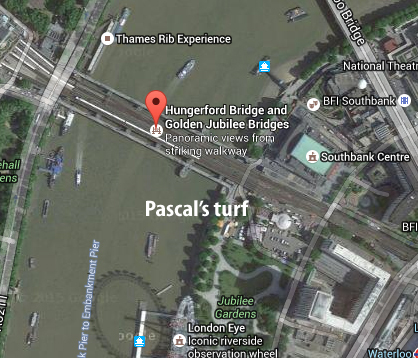 On days when he's not on the South Bank, Pascal composes and produces multi-instrumental tracks used in film projects and by the BBC, and he's recording a solo Stick project as well. Influenced by classic film composers like John Williams and John Barry, Pascal's tunes are strongly thematic, but also reflect the more minimalist works of Icelandic composer Jóhann Jóhannsson , another of his favorites. A self-taught pianist, Pascal first got into The Stick in 1993, with an oak ten-string. And while he also plays guitar and bass, piano is the biggest influence on his distinctive Stick style, a style characterized by lush two-handed arpeggios that define the progression, layer the harmony and embellish the melody all at once. Labrynths, "10 tracks of intimate and passionate solo Chapman Stick" is just now available via BandCamp. Listen to sample tracks here. 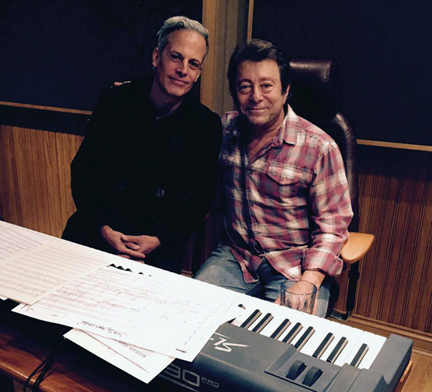 Pascal and Jeff Wayne at Wayne's Lyndhurst, England studio, October, 2015. Composer Jeff Wayne invited Pascal out to his Lyndhurst studio to lay down some Stick tracks for a new theater production of his popular musical version of the "War of the Worlds." Pascal laid down bass chord and melody parts for this Stick feature, which also including a full orchetsra and children's choir. Stay tuned for news about the production and release of the song, called "With Joy, Hope and Wonder.